When I was growing up, my family lived away from both sets of my grandparents. As a military family, we lived where my father was stationed, so as a result I only got to see my grandparents once or twice a year. Every summer my parents packed my brother and I up and sent us back to Ohio (where both sets lived) for a week or two. One visit when I was relatively young (six or seven), my grandmother on my mom’s side decided to take my brother and I strawberry picking. Her sister, my great-aunt, owned a fruit farm in the area, so we went there. Given small containers, my brother and I were led to a row of strawberries and my grandmother told us to go ahead and start picking strawberries. Not having done this before, having minimal instructions and being pretty young, I not only took to the task with gusto but without much of a clue. I wanted to do well so picked every strawberry and put them in the bucket. Every great, sweet looking one. Every one that was gushy and well past its prime. Every green one that was nowhere near ripe. Every one. I brought the container to my grandmother when it was full and I can still remember the look of shock on her face and then the fully belly laugh that came next. While you could make this with strawberries, I chose blueberries this time. 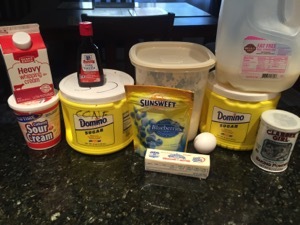 A lot of your typical bakery ingredients. 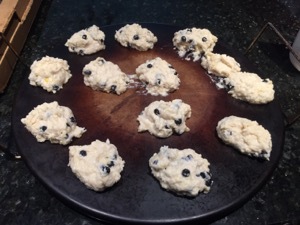 Using dried blueberries keeps them from disintegrating and turning the whole scone purple. With a little jam and cream. Yum! Sift flour with baking powder into bowl. Rub margarine in until it looks like fine bread crumbs. Stir in sugar and dried fruit. Add egg, then water/milk and stir with a flat knife. Knead to form a dough. Transfer to a floured board. Roll out into 2-inch patties. 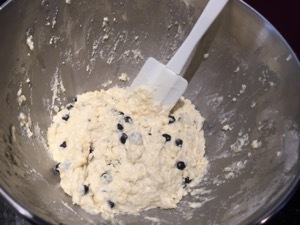 Place onto prepared, greased and floured pan. Brush tops with a little of remaining egg; sprinkle with sugar. Bake at 450 degrees for 15 minutes or until golden brown. 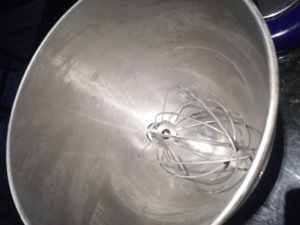 Place whipping cream in a mixing bowl. Chill bowl with cream and beaters in the freezer for 5 minutes. Use the mixer to whip chilled cream until stiff peaks form. While still mixing, slowly add the powdered sugar and vanilla. Continue to beat until stiff peaks form. Fold in the sour cream. Refrigerate in a covered bowl until ready to serve. 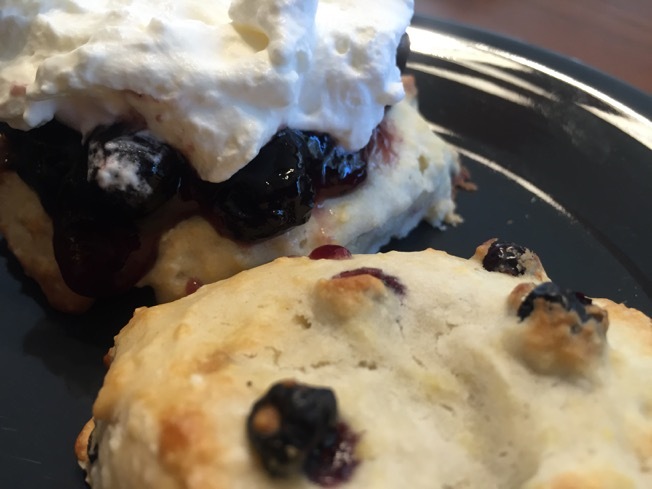 Serve over fresh fruit or use as a topping for scones. For Devonshire Cream Teas: spread with strawberry jam and top with thick cream. 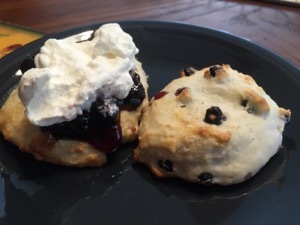 VARIATION: replace sugar with grated cheese, omit fruit for a delicious savory scone. 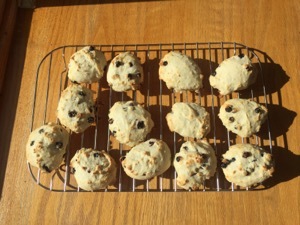 Or for fruit cobbler, omit dried fruit only and then serve scone hot with stewed fruit, topped with cream. What a fun memory! Wasn’t there that time, but I remember going too, only mine never made it in the bucket😃 Think I ate way more than I picked. Either way, those Marion Summer’s with you are some of my best childhood memories! You are the queen of scones and I bow down before you!